Good Thursday to everyone, and welcome into yet another amazing rendition of the Daily Noontime! Let’s kick-start the day with some news from the city of champions! * Kevin Garnett’s 20-foot jumper with six seconds remaining in the fourth quarter provided the Boston Celtics with a 105-103 win on Wednesday against the Golden State Warriors. 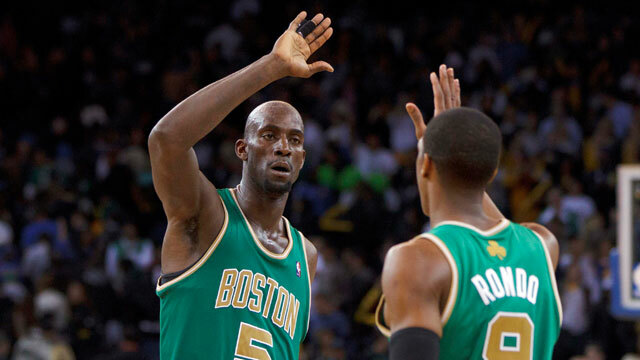 Garnett paced the Green and White with 24 points, while Brandon Bass added 22 points. Boston is now 2-1 on their current eight-game swing, and will return to the court on Friday when they tip-off against the Sacramento Kings. * Sources confirmed on Wednesday evening that Celtics forward/center Chris Wilcox will undergo aortic surgery on Mar. 29, and miss the remainder of the season. * Sources have confirmed that the Celtics are possibly considering trading Paul Pierce to the Portland Trailblazers. The NBA trade deadline is set to conclude at 3PM on Thursday, and it’s likely that president of operations Danny Ainge will pull the trigger. * The Boston Bruins will look to snap their three-game skid on Thursday evening when they face-off against the Panthers in Florida. The Panthers enter the contest having won two of their last three matchups against Carolina and Toronto. * Harvard University’s men’s basketball team will begin their quest toward NCAA glory on Thursday when they tip-off against Vanderbilt University. Also, UMass will play its second round NIT game against Seton Hall on Saturday, Mar. 17, at 11AM. * Finally, the New England Patriots acquired former Cincinnati Bengals defensive lineman Jonathan Fanene on Wednesday, as well as inked his name to a three-year, $12 million deal. Fanene has spent the past seven season with the Bengals, as well as ended this pasts season with 24 tackles, 17 solo tackles and 6.5 sacks. The NFL announced the 2011 playoff schedule on Sunday, and here are the potential match-ups. The New England Patriots have clinched the East and a first-round bye. If they beat the Buffalo Bills on Sunday, they’ll wrap up home-field advantage throughout the playoffs. In the North, the Baltimore Ravens and Pittsburgh Steelers have both clinched playoff spots. One of them will win the division; the other will be a wild card. Baltimore owns the tiebreaker by virtue of beating Pittsburgh twice. The Ravens will travel to Cincinnati, while the Steelers play at Cleveland. The Houston Texans have won the South, and are locked into the No. 3 seed. The Denver Broncos and Oakland Raiders are tied atop of the West. If they’re still tied after next week, Denver owns the tiebreaker. Those two teams face the Chiefs and Chargers, respectively. Whoever doesn’t win the division will be out. That leaves one card spot open. The “win and you’re in” team is Cincinnati. All the Bengals have to do is beat the Ravens at home, in one of the marquee games of the final weekend. If Cincy stumbles, the Raiders, Titans and Jets can all sneak in, but they’ll also need help from the respective squads.